I've repeatedly mentioned my ongoing quest to find safer skincare products like baby shampoo, hand soap and sunscreen for my family. It's been so disheartening to discover that major brands sell products that contain ingredients containing hormone disruptors, possible carcinogens and skin irritants (check out EWG's Sunscreen Hall of Shame for some examples) marketed towards parents and their children. I've been happy with a lot of my non-toxic finds, but I'm always interested in exploring my options. I recently tried Kid Safe Screen, SPF 25+ by Marie Veronique Organics and became an instant fan. The sunscreen contains no harmful chemicals, nanoparticles, parabens, petroleum products, fillers, waxes or fragrances and even earned a spot on Environmental Working Group's Best Beach and Sport Sunscreens list this year. You can check out the natural ingredients and all of the other product details here on the Marie Veronique Organics website. The best part of the lotion, other than it's non-toxicity, is the dispenser. It squirts out of the bottle easily and gives you just the right amount on your finger tips. I cannot stress how much easier this makes my life. You might not understand how vital this is, if you've never tried to apply sunscreen on a writhing, wild animal toddler several times a day, every day for an entire summer. I also like the natural, light summery scent and the way it leaves a bit of a sheen on Nate so I can tell which areas I've already covered. Really, my only complaint is the size. Since we spend so much time outside, I whipped through the bottle pretty fast. The small size was convenient for shoving in the diaper bag or stroller so I carried it with me everywhere. I'm sorry we used it up so fast and really need to get some more. What's your favorite sunscreen? Have you checked it's ranking on EWG's Skin Deep? BUY: You can purchase Marie Veronique Organics Kid Safe Screen on their website HERE. Check out their other products while you're there. 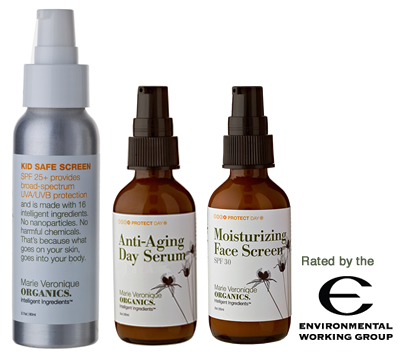 Receive a free 1/4oz Anti-Aging Oil+ with the purchase of a Moisturizing Face Screen ($20 value) with code NaterTot. Offer expires July 31, 2011. You can also find Marie Veronique products at Amazon.com *.